Red-hatched areas show Communist enclaves. Areas marked by a blue "X" were overrun by Kuomintang forces during the Fourth Encirclement Campaign, forcing the Fourth Red Army (north) and the Second Red Army (south) to retreat to more western enclaves (open dotted lines). The solid dotted line is the route of the First Red Army from Jiangxi. The withdrawal of all three Red Armies ends in the northwest enclave of Shanxxi. The Long March (Traditional Chinese: 長征; Simplified Chinese: 长征; pinyin: Chángzhēng) was a massive military retreat undertaken by the Red Armies of the Communist Party of China (CPC), the forerunner of the People's Liberation Army, to evade the pursuit of the Kuomintang (KMT or Nationalist Party) army. There was not one Long March, but several, as various Communist armies in the south escaped to the north and west. The most well known is the march from Jiangxi province which began in October 1934. The First Front Army of the Chinese Soviet Republic, led by an inexperienced military commission, was on the brink of complete annihilation by Chiang Kai-shek's troops in their stronghold in Jiangxi province. The Communists, under the eventual command of Mao Zedong and Zhou Enlai, escaped in a circling retreat to the west and north, which reportedly traversed between 6,000 and 8,000 miles over 370 days. The route passed through some of the most difficult terrain of western China by traveling west, then north, to Shaanxi. The Long March began the ascent to power of Mao Zedong, whose leadership during the retreat gained him the support of the members of the party. The bitter struggles of the Long March, which was completed by only one-tenth of the force that left Jiangxi, came to represent a significant episode in the history of the Communist Party of China. Other participants in the March also went on to become prominent party leaders, including Zhu De, Lin Biao, Liu Shaoqi, Dong Biwu, Ye Jianying, Li Xiannian, Yang Shangkun, Zhou Enlai and Deng Xiaoping. Although the literal translation of the Chinese Cháng Zhēng is “Long March,” official publications of the People's Republic of China refer to "The Great March of the Red Army" (Chinese traditional: 紅軍長征, Chinese simplified: 红军长征, pinyin: Hóng Jūn Cháng Zhēng). The Long March most commonly refers to the transfer of the main group of the First (or Central) Red Army, which included the leaders of the Communist Party of China, from Yudu in the province of Jiangxi, to Yan'an in Shaanxi. In this sense, the Long March lasted from 16 October 1934 to 19 October 1935. In a broader view, the Long March included two other forces retreating under pressure from the Kuomintang: the Second Red Army and the Fourth Red Army. The retreat of all the Red Armies was not complete until October 22, 1936, when the three forces linked up in Shaanxi. The divisions of the "Chinese Workers' and Peasants' Red Army" (紅軍) were named according to historical circumstances, sometimes in a nonconsecutive way. Early Communist units often formed by defection from existing Kuomintang forces, keeping their original designations. By the time of the Long March, numerous small units had been organized into three unified groups, the First Red Army (紅一方面軍/红一方面军/Hóng Yī Fāngmiàn Jūn), the Second Red Army (紅二方面軍/红二方面军/Hóng Èr Fāngmiàn Jūn) and the Fourth Red Army (紅四方面軍/红四方面军/Hóng Sì Fāngmiàn Jūn). Some translations refer to these same units as the “First Front Red Army," “Second Front Red Army” and “Fourth Front Red Army" to distinguish them from the earlier organizational divisions. The First Red Army formed from the First, Third and Fifth Army Groups in southern Kiangsi under command of Bo Gu and Li De. When the Fourth Red Army under Zhang Guotao was formed in the Szechuan-Shensi border area from several smaller units, no standard nomenclature of the armies of the Communist Party existed; moreover, during the Chinese Civil War central control of separate Communist-controlled enclaves within China was limited. After the organization of these first two main forces, the Second Red Army formed in eastern Kweichow by unifying the Second and Sixth Army Groups under He Long and Jen Pi-shih. A “Third Red Army" was never established. The three armies would maintain their historical designation as the First, Second and Fourth Red Armies until Communist military forces were nominally integrated into the National Revolutionary Army, forming the Eighth Route Army and the New Fourth Army, during the Second Sino-Japanese War from 1937 to 1945. Generalissimo Chiang Kai-shek encircled the Communists in Jiangxi in 1934. The Communist Party of China (CPC), founded in 1921 by Chen Duxiu with Soviet support, initially collaborated with the Chinese Nationalist Party or Kuomintang (KMT), founded by the revolutionary republican Sun Yat-sen. After the unexpected death of Sun in March of 1925, a power struggle within the KMT favored Chiang Kai-shek, whose Northern Expedition forces succeeded in wresting control of large areas of China from local warlords, establishing a unified government in Nanjing in April 1927. Unlike other nationalist leaders, like Wang Jingwei, Chiang was hostile to continued collaboration with the Communists. This initial period of cooperation to unify China against the feudal warlords and the Japanese Empire ended abruptly in April of 1927 when Chiang Kai-shek struck out against the Communists. Unsuccessful urban insurrections (in Nanchang, Wuhan and Guangzhou) and the suppression of the Communist Party in Shanghai and other cities finally drove many party supporters to rural strongholds such as the Jiangxi Soviet organized by Mao Zedong. By 1928, deserters and defecting Kuomintang army units, supplemented by peasants from the Communist rural soviets, formed the Chinese Workers' and Peasants' Red Army. The ideological confrontation between the CCP and the KMT soon evolved into the first phase of the Chinese Civil War. By 1930, the Communist Red Army had established the Chinese Soviet Republic in the provinces of Jiangxi and Fujian around the city of Ruijin, including industrial facilities. Between 1930 and 1933, four attempts by Chiang to defeat the Communists were repelled by forces led by Mao. In spite of these successes, the Soviet Union and Comintern-influenced leaders of the party distrusted the ideas of Mao, who held that the rural Chinese peasants, not the urban proletariat, were the Communist party's base. In October, 1933, a Fifth Counter Encirclement Campaign was undertaken with 700,000 troops and the aid of General Hans von Seeckt of the German High Command. Pillboxes, forts and checkpoints were set up on all the roads to cut supply lines and slowly starve the Communist forces. Reluctantly the Chinese Communist Party began to make preparations to flee the Jiangxi Soviet. Zhu helped to form the break out from the soviet that began the Long March. In October 1934, 90,000 men escaped in five separate groups and rejoined later to start the 6,000-mile Long March to Shensi province (1934–1935). In October 1933, with the advice and tactical assistance of his German adviser, Hans von Seeckt., 700,000 troops from the National Revolutionary Army under Chiang Kai-shek eventually completely encircled Jiangxi, setting up pillboxes, forts and checkpoints on all the roads to cut supply lines. A fortified perimeter was established by Chiang's forces, and Jiangxi was besieged in an attempt to destroy the Communist forces trapped within. By May 1928, basic principles of guerrilla warfare, simple in nature and suited to the conditions of the time, had already been evolved…. But beginning from January 1932… the old principles were no longer to be considered as regular, but were to be rejected as "guerrilla-ism." The opposition to "guerrilla-ism" reigned for three whole years. In August 1934, with the Red Army depleted by the prolonged conflict, a spy placed by Zhou Enlai in the KMT army headquarters in Nanchang brought news that Chiang Kai-shek was preparing a major offensive against the Communist capital, Ruijin. To avoid annihilation, the Communist leadership decided on a strategic retreat to regroup with other Communist units. The original plan was to link up with the Second Red Army commanded by He Long, thought to be in Hubei to the west and north. 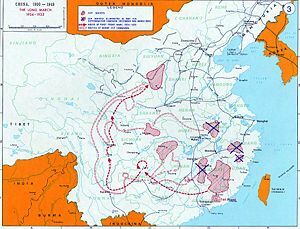 Communications between divided groups of the Red Army had been disrupted by the Kuomintang campaign, and during the planning to evacuate Jiangxi, the First Red Army was unaware that these other Communist forces were also retreating westward. The first movements of the retreat were undertaken by forces led by Fang Zhimin, breaking through Kuomintang lines in June 1934, followed by Fe Ke Yu in August. Although Fang Zhimin's troops were soon neutralized, these movements surprised the Kuomintang, who were numerically superior to the Communists at the time and did not expect an attack on their fortified perimeter. The early troop movements were actually a diversion to allow the retreat of more important leaders from Jiangxi. On October 16, 1934, a force of 130,000 under Bo Gu and Li De attacked the line of Kuomintang positions near Yudu. More than 86,000 troops, 11,000 administrative personnel and thousands of civilian porters actually completed the breakout; the remainder, largely wounded or ill soldiers, continued to fight a delaying action after the main force had left, and then dispersed into the countryside. Several prominent members of the Chinese Soviet who remained behind were captured and executed by the Kuomintang after occupation of Ruijin in November 1934, including Qu Qiubai and the youngest brother of Mao Zedong, Mao Zetan. The sick, elderly and very young had to be left behind, including two young children born to Mao’s companion, He Zizhe (Ho Tzu-che), who accompanied Mao on the march. Initially the First Red Army, with its baggage of top communist officials, records, currency reserves and other trapping of the exiled Chinese Soviet Republic, fought through several lightly defended Kuomintang checkpoints, crossing the Xinfeng river and through the province of Guangdong, south of Hunan and into Guangxi. At the Xiang river, Chiang Kai-shek had reinforced the KMT defenses. In two days of bloody fighting, November 30 to December 1, 1934, the Red Army lost more than 40,000 troops and all of the civilian porters, and there were strongly-defended Nationalist defensive lines ahead. Personnel and material losses after the battle of the Xiang river affected the morale of the troops and desertions began. At a meeting of Party leaders in Tongdao on December 12, 1934, discontent with Bo Gu and Otto Braun surfaced, and Mao Zedong began to take a more active role in the leadership. Under these conditions, the Communists met in Zunyi in Guizhou province from January 15–17, 1935 to reshuffle the Party politburo. Although the failed leadership of Bo Gu and Li De was denounced, after three days Mao was not able to win the support of a sufficient number of Party leaders to gain outright power at the conference. Mao was passed over for the position of General Secretary by Zhang Wentian, but gained enough influence to be elected one of three members of Military Affairs Commission. The other two members, Zhou Enlai (appointed Director of the Commission) and Wang Jiaxiang, whose support Mao had enlisted earlier, were not as highly regarded in military affairs, leaving Mao in effective control of the First Red Army after the Zunyi conference. When the army resumed its march north, the direct route to Sichuan was blocked by Chiang's forces. Mao's forces spent the next several months maneuvering to avoid direct confrontation with hostile forces, but still attempting to move north to join Zhang Guotao's Fourth Red Army. During this period, in February 1935, Mao's wife, He Zizhen, gave birth to a daughter. Because of the harsh conditions of the retreat, the infant was left with a local family. In 2003, two British men retracing the route of the Long March met a woman in rural Yunnan province, said by local officials to be Mao and He Zizhen's long-lost daughter. By moving south and west, the First Red Army finally broke out of Guizhou and crossed the Yangtze on May 8, 1935. The Communist forces had now been on the move for seven months since leaving Jiangxi and had only 25,000 men left. Penetrating northward into areas populated by ethnic minorities hostile to Chinese encroachment, the Communist forces were not only harassed by the Kuomintang and their local warlord allies, but also by tribes hostile to all ethnic Chinese. The terrain was another formidable opponent: the Red Army had to cross mountains and rivers, often capturing river crossings heavily defended by hostile warlords and Nationalist troops, such as the Luding Bridge. In July 1935, the troops under Mao united with the Fourth Red Army, led by Zhang Guotao, which had retreated west from Henan. The Communist leadership was determined to move into Shaanxi province, although the decision was not unanimous. Zhang Guotao preferred to establish a refuge near the border with the Soviet Union. In command of a much smaller force, Mao carefully avoided Zhang's discovery of this fact, and overcame Zhang's influence over the subordinate commanders of the Communist forces. After disagreement over the direction in which the troops should move, the two forces split up. Mao's First Red Army traversed several swamps and suffered ambushes from the Tibetans and the Hui. In May, 1935, Mao’s group crossed the Golden Sand River into the west China mountains, making the crossing in small boats over a period of eight days and nights. 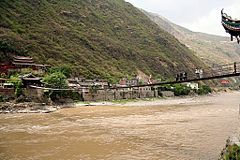 When they arrived at the Dadu River, they found only a single suspension bridge, with all the planks removed, guarded by a blockhouse at the other end. Twenty volunteers armed with swords and hand grenades swarmed along the chains, overcame the garrison and replaced the planks on the bridge. The group made its way across swamps and marshes, over more mountains and through two enemy lines to join the 15th Red Army Corps by October 20, 1935. They established a base at Yan’an and began to organize the area, gaining members from among local peasants, Muslims and secret societies. 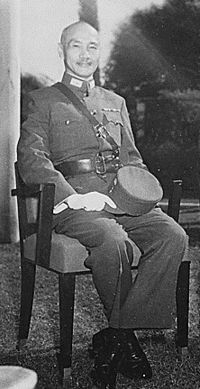 Zhang Guotao's Fourth Red Army, which took a different route, south, then west and finally north through China, was largely destroyed by the forces of Chiang Kai-shek and his Chinese Muslim allies, the Ma clique. The remnants of Zhang's forces joined elements of the Second Red Army, eventually linking up with Mao's forces in Shaanxi.In 1937, when the Communist Party put Zhang on trial and ordered him to undertake “rectification study,” he defected to the Kuomintang. Tiger Leaping Gorge in the Jade Dragon Snow Mountain massif of western Yunnan province. The Second Red Army began its own withdrawal west from Hubei in November 1935, led by He Long, who commanded the KMT Twentieth Army in 1923 before joining the Communist Party of China (CPC). In retribution, Chiang Kai-Shek had He Long's relatives executed, including three sisters and a brother. In 1932 he established a soviet in the Hunan-Kiangsi border area, and in August 1934 received command of the Second Red Army, establishing a base in Hubei. An advance party of the First Red Army called the Sixth Group, commanded by Xiao Ke, was sent towards the Second Red Army two months before the beginning of the Long March. Xiao Ke's force would link up with He Long and his army, but lost communication with the First Army that came behind. On November 19, 1935, the Second Red Army set out on its own Long March. He Long's force was driven further west than the First Red Army, all the way to Lijiang in Yunnan province, then across the Jade Dragon Snow Mountain massif and through the Tibetan highlands of western Sichuan. He Long and Xiao Ke were married to sisters who also accompanied the army. He Long's wife, Jian Xianren, carried the baby daughter she had given birth to three weeks before the retreat began. Jian Xianfo gave birth to a son in the desolate swamps of northern Sichuan. Forces of the Second Army detained two European missionaries, Rudolf Bosshardt and Arnolis Hayman, for 16 months. Bosshardt later related his account of the details of daily life on the Long March in a book.. In 2005, Ed Jocelyn and Yang Xiao retraced the rugged path of the Second Red Army's Long March. The remnants of Zhang's Fourth Red Army eventually joined Mao in Shaanxi, but with his army destroyed, Zhang, even as a founding member of the CCP, was never able to challenge Mao's authority. After an expedition of almost a year, the Second Red Army reached Bao'an (Shaanxi) on October 22, 1936, known in China as the “union of the three armies,” and the end of the Long March. All along the way, the Communist Army confiscated property and weapons from local warlords and landlords, while recruiting peasants and the poor. Nevertheless, only some 8,000 troops under Mao's command, the First Front Army, ultimately made it to the final destination of Yan'an in 1935. Of these, less than 7,000 were among the original 100,000 soldiers who had started the march. A variety of factors contributed to the losses including fatigue, hunger and cold, sickness, desertion, and military casualties. During the retreat, membership in the party fell from 300,000 to around 40,000. Those on the Long March covered 6000 miles on foot in just over one year, crossing 24 rivers and 18 mountain ranges, five of which were under permanent snow. They traversed 16 provinces and took 62 cities; there were 15 pitched battles and almost daily attacks of some sort. On marching days, the group averaged a distance of 24 miles per day.Military commanders were carried most of the way on litters, after staying up every night to review army intelligence and plan the logistics for the next day’s march. About 50 women survived the march, including Mao’s second wife He Zizhe (Ho Tzu-che); Deng Yingchao (Teng-Yingch’ao), the wife of Zhou Enlai; and Ding Ling (Ting Ling), a famous author. While costly, the Long March gave the Communist Party of China (CPC) the isolation it needed, allowing its army to recuperate and rebuild in the north of China. In Yan,an, the Chinese communists developed their ideology, their methods of indoctrination and their guerrilla tactics. The determination and dedication of the surviving participants of the Long March was vital in helping the CPC to gain a positive reputation among the peasants. In addition, the Eight Points of Attention, a policy instructing the soldiers of the Red Army to avoid harming or disrespecting the peasants, in spite of the desperate need for food and supplies, helped to win support for the Communists among the rural peasants. The Long March is a manifesto. It has proclaimed to the world that the Red Army is an army of heroes, while the imperialists and their running dogs, Chiang Kai-shek and his like, are impotent. It has proclaimed their utter failure to encircle, pursue, obstruct and intercept us. The Long March is also a propaganda force. It has announced to some 200 million people in eleven provinces that the road of the Red Army is their only road to liberation. The Kuomintang were making preparations to wipe out the Communists, but hostilities ceased while the Nationalists and Chinese Communists formed a nominal alliance during the Second Sino-Japanese War from 1937 until 1945. In 1936, the Communists persuaded sympathetic Kuomintang commanders Zhang Xueliang and Yang Hucheng to form an alliance with them against the Japanese, who had established the puppet state of Manchukuo in Zhang’s homeland of Manchuria. On December 12, 1936, they kidnapped Chiang Kai-shek and held him captive until he agreed to stop fighting against the Communists and instead lead a united front against the Japanese. During these years, the Chinese Communist Party persevered and strengthened its influence. The Red Army fought a disciplined and organized guerilla campaign against superior Japanese forces, allowing it to gain experience. Following the end of World War II, the resurgent Communist Eighth Route Army, later called the People's Liberation Army, returned to drive the Kuomintang out of Mainland China to the island of Taiwan. Since the establishment of the People's Republic of China in 1949, the Long March has been glorified as an example of the Communist Party's strength and resilience. Before the Long March, Zhou Enlai was dominant in the Chinese Communist Party; during the March Mao solidified his status as the undisputed leader of the CCP. Other participants in the March also went on to become prominent party leaders, including Zhu De, Lin Biao, Liu Shaoqi, Dong Biwu, Ye Jianying, Li Xiannian, Yang Shangkun, Zhou Enlai and Deng Xiaoping. In 2003, controversy arose about the true distance covered by Mao's First Front Army in the Long March. The figure of 25,000 li (12,500 kilometers or about 8,000 miles) was Mao's estimate, quoted by his biographer Edgar Snow in Red Star Over China, published not long after the end of the Long March in 1935. In 2003, two British researchers, Ed Jocelyn and Andrew McEwen, retraced the route in 384 days, and in their 2006 book The Long March estimated the March actually covered about 6,000 km (3,700 miles). Their report has been disputed by the Chinese media. ↑ Arvo Vercamer, The German Military Mission to China: 1927-1938, Feldgrau.com. Retrieved 23 November 2006. ↑ Thomas Kampen. Mao Zedong, Zhou Enlai and the Evolution of the Chinese Communist Leadership. (Nordic Institute of Asian Studies, 2000. ISBN 8787062763), 58-61. (in English) . ↑ Chang and Halliday have recently offered a reinterpretation of this period of the March, suggesting that, in fact, Mao deliberately delayed the move into Sichuan in order to consolidate his personal power before joining up with the other parts of the Red Army, and that rather than facing direct attack from Chiang's forces, the army was in fact being deliberately herded into Sichuan by Chiang. (Chang, Halliday, in Mao, The Unknown Story, 135-162) The work, however, has been criticized for being unscholarly and anecdotal. For example, Kaz Ross (profile) concludes in Mao: the too familiar story (abstract), that while "The western media have been overwhelmingly supportive [of the book]… Mao: the Unknown Story is a misleading and dangerous text." Retrieved September 23, 2007. ↑ Samuel B. Griffith, (translator). On Guerrilla Warfare by Mao Tse-tung (1937). (Dover Books on History, 2005. ISBN 0486443760), 94. Bosshardt, Rudolf A. The Restraining Hand: Captivity for Christ in China. London: Hodder and Stoughton, 1936. Chang, Jung, & Jon Halliday, Mao: the unknown story. (in English). Alfred A. Knopf, 2005. ISBN 0679422714. Griffith, Samuel B., translator. Yu Chi Chan (On Guerrilla Warfare) by Mao Tse-tung. (1937) (in English). (Dover Books on History) Dover, 2005. ISBN 0486443760. Jocelyn, Ed, & Andrew McEwen, The Long March. (in English). Constable and Robinson, 2006. ISBN 1845292553. Kampen, Thomas Mao Zedong, Zhou Enlai and the Evolution of the Chinese Communist Leadership. (in English). Nordic Institute of Asian Studies, 2000. ISBN 8787062763. Morton, W. Scott, and Charlton M. Lewis. China: its history and culture. New York: McGraw-Hill, 2005. ISBN:0071412794. Salisbury, Harrison Evans. The Long March: The Untold Story. (in English). New York: Harper & Row, 1985. ISBN 0060390441. Shuyun, Sun. The Long March. Harper Collins, 2006. ISBN 000719479X. Snow, Edward. Red Star Over China, rev. ed. (in English). New York: Grove Press, 1968. ISBN 0802150934. Yang, Benjamin. From Revolution to Politics: Chinese Communists on the Long March. (in English). Boulder, CO: Westview Press, 1990. ISBN 0813376726. Key events of the Long March - Account of the Long March by the China Daily..
Map of primary route - Locations of the First Front Army route with dates. Long March routes of the Communist armies - Routes of the First, Second and Fourth Front Armies. Luding Bridge - Chinese propaganda posters depicting the battle for Luding Bridge. The Long March: 70 Years On - Official Chinese website marking the 70th Anniversary of Long March. This page was last modified on 25 July 2018, at 16:02.